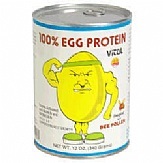 What sets 100% Egg Protein by Vitol apart from other protein powders is that it is energized with bee pollen. The unique energizing formula provides nutrients that are beneficial for substantial muscle growth and post-workout healing. Super athletes add bee pollen to their diet, and with Vitol’s formula digestion is also aided. 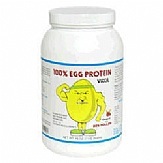 100% Egg Protein is enzyme activated with Papain and Bromelain. With a P.E.R. of 3.9, Vitol promotes and supports muscle enhancement. The P.E.R. or Protein Efficiency Ratio is a government standard for determining the quality of protein. The ratio measures the protein’s ability to support growth which was determined through extensive study and experiments. As a protein supplement it is recommended that two tablespoons be added to the juice of your choice. For best results use a blender with crushed ice. A delicious milk shake of egg protein can be made by adding honey, malt, maple syrup, or molasses. The powder may also be added to soups, cereals (both hot and cold), gravies, ground meat, and even baked goods.